We had brunch here for the second time. We got there around opening time and it looked like they were not ready for business yet. It took a while to get napkins and silverwares and we watched them folding napkins in the back. We already knew the portions were small so we got three dishes to share. 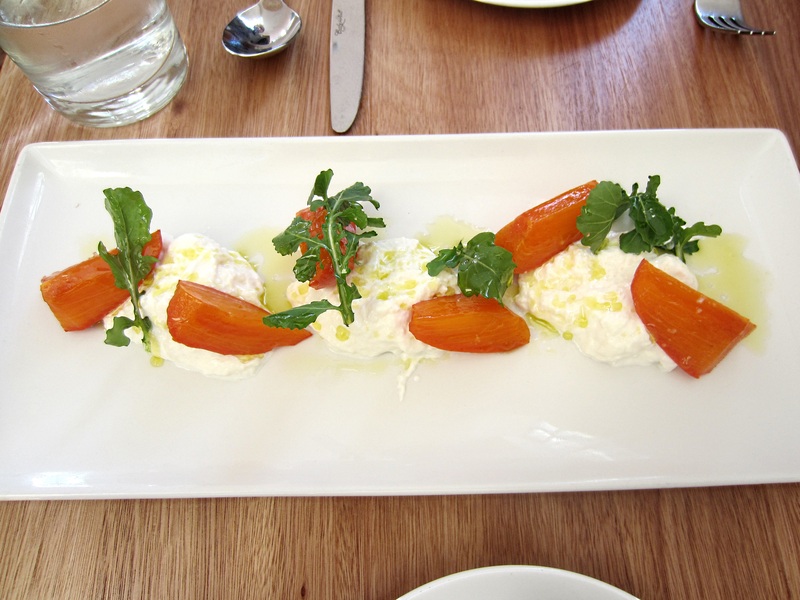 Our waitress suggested the Burrata with Persimmon and it was so delicious. The Burrata was the best I have tasted in a long time and the Persimmons were sweet and luscious. I had to ask her where they got the Burrata. Funny enough it was The Di Stefano Burrata that I have purchased from a cheese shop before and they even sell it at Whole Foods; But somehow it tasted much better here. 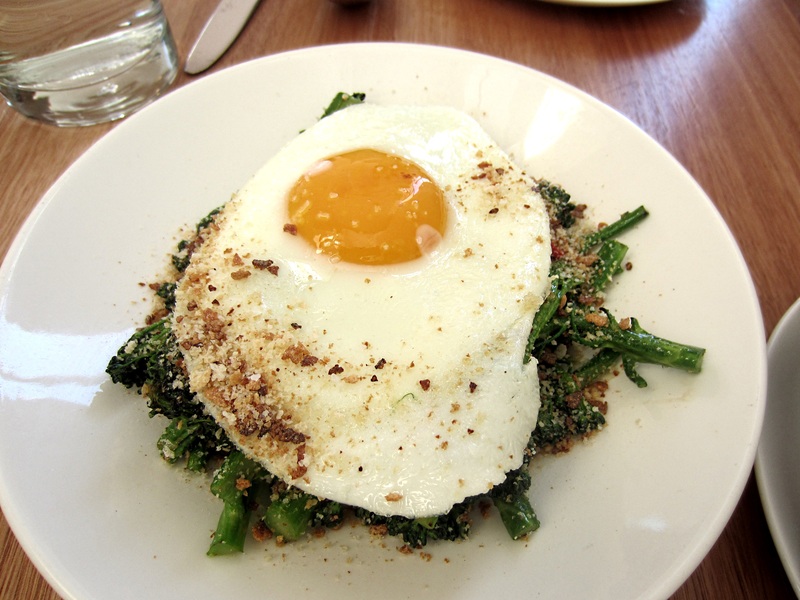 our second dish was a very flavorful Sprouted Broccoli with Toasted Bread Crumbs and Egg. It had a lot of delicious spices. The toasted Bread Crumbs gave it a nice crunchiness and the egg added a little protein. Our last dish was Meatballs with Polenta and Greens. It was a great dish. The meatballs were cooked perfectly and had a nice flavor from all the spices they used. 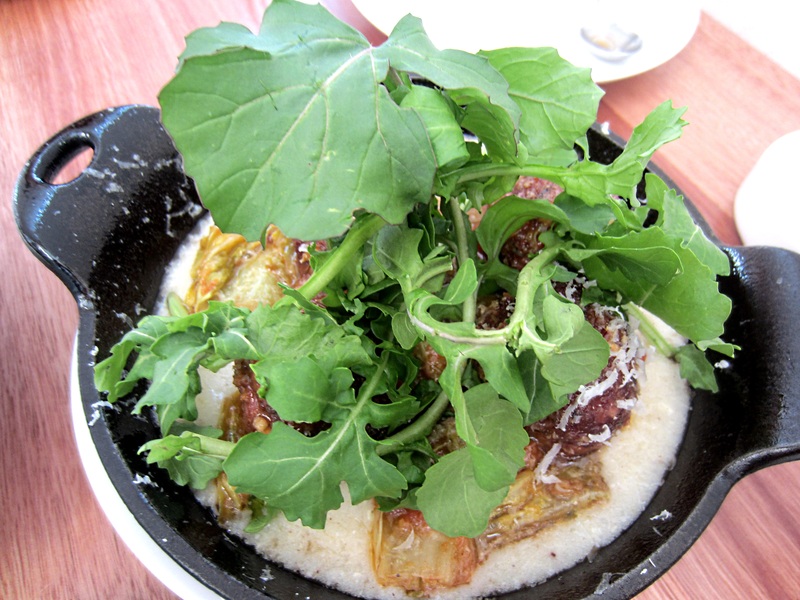 The Polenta was very creamy and the greens rounded out the dish. At some point one of the kitchen staff told me they don’t want any photography in the restaurants. That is odd since reviews with pictures had help me to go to many restaurants before. So basically it is a free PR for them. As much as we enjoy their food and considering the small portions and high prices, if I can’t take a picture of my food we won’t be returning here that often. 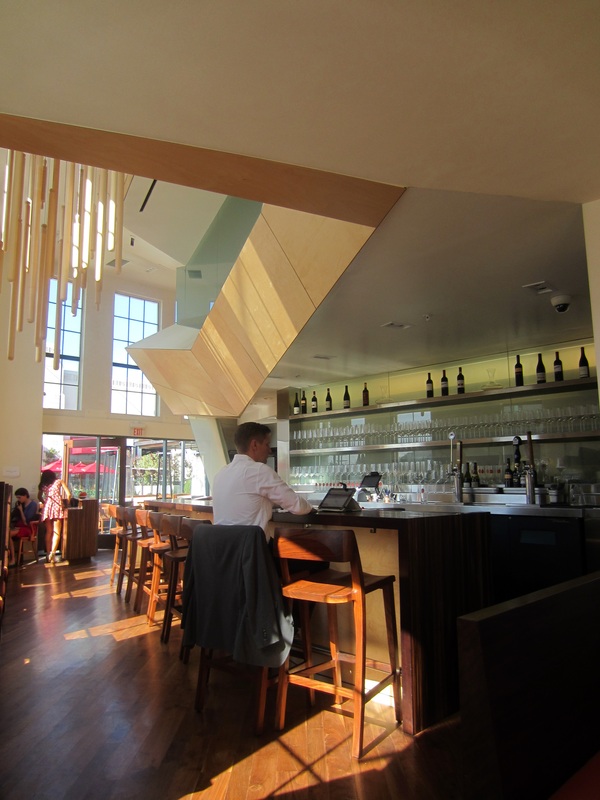 I had heard so much about Evan Funke’s Bucato restaurant in the Helms Building in Culver city. When I read that they had started their brunch menu, we decided to give their brunch a try. They only take same day reservation and there is a no photo and cell phone policy. We called them to make a reservation on the way to the restaurant but we got the machine. I left a message, but no one called me back. When we got to the restaurant around 10:15 a.m. only one table was occupied. The restaurant was on the small side but it had nice design touches. We were seated by the window and their no photo policy didn’t stop me from snapping a couple of pictures. I told my husband it is day time and since we were one of the two tables occupied, it was unlikely that they would make a fuss about it. Service was attentive but since they served their coffee pour over it took a while for us to get our coffee. 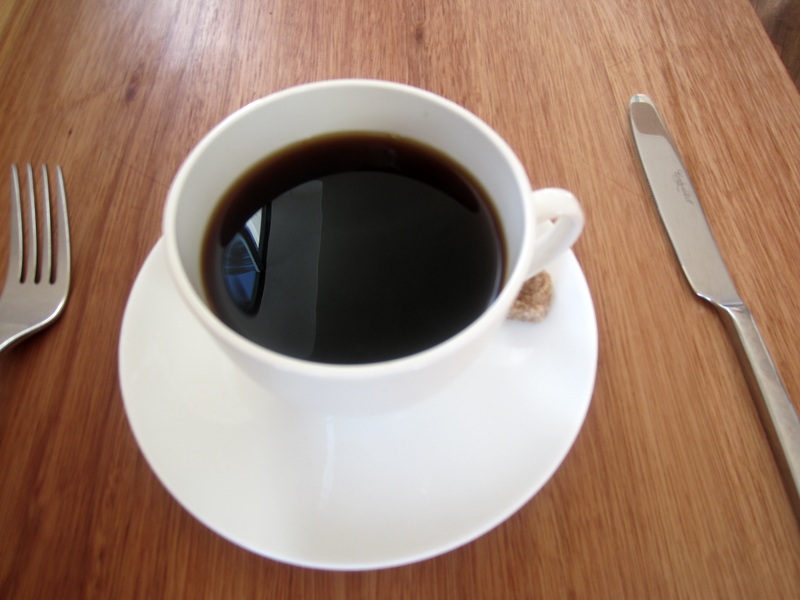 It was a good coffee and was not acidic or too strong. 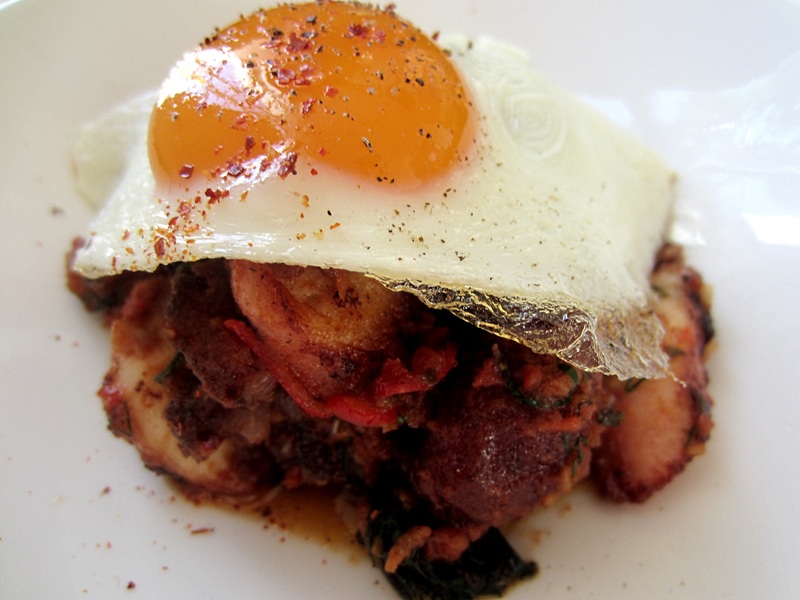 My husband had the octopus hash and it was more like a octopus and potato stew with a fried egg on top. It was a hearty dish with good flavors. 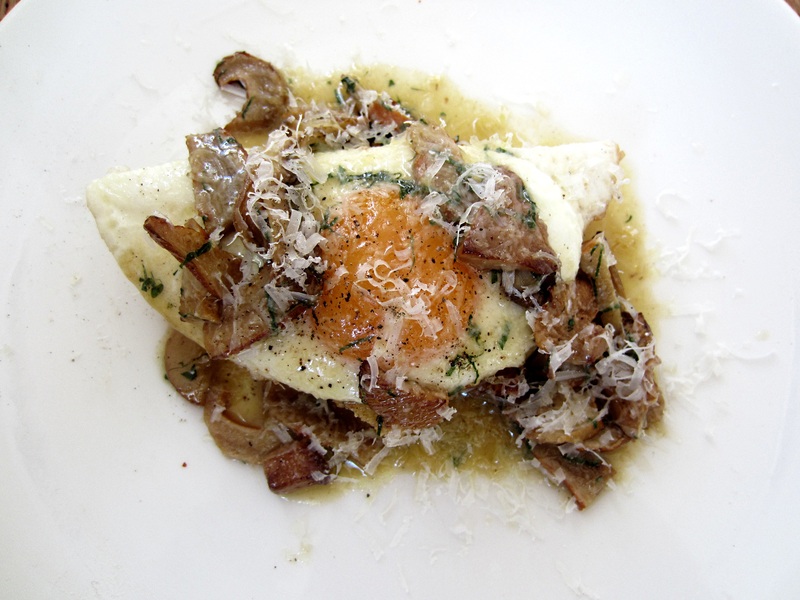 My Crispy Polenta with Wild Mushrooms and Sunny Egg was really delicious, but on the small side for $17. I really loved the crispy polenta and the Lobster Mushrooms, but they should have either give you a second egg or more Mushrooms. Our waitress asked us if we wanted a second cup of coffee and by the time we got our second cup we were finished with our brunch, but the second cup tasted better than the first one. Overall, a nice experience and I hope that they increase their portions.